Dehydration among children pose a great danger. The body surface of a child compared to an adult must be maintained well enough since it has a thin gap between being well hydrated from dehydrated. Children lose fluids easier than adults. Their capability to access to fluids are also the barriers in maintain enough fluids. They depend more on their caregivers to give this type of basic need, therefore it is very important to educate and encourage them to be vigilant against dehydration. Viral infection – A child with dehydration from a viral infection may have fever, diarrhes, vomiting and decreased appeptite. These are also reasons for dehydration to quickly occur. Mouth sores- Mouth sores are painful making the child irritable and unable to drink fluids as he used to be. The challenge for the caregiver here is to maintain adequate fluid despite the sores. The sores exposes the child to greater danger of infection on the skin and systematically. Hot environment – An environment that has a higher temperature can make the child sweat more than the usual. He or she may even drink more however the fluid loss is still hard to catch up. Rare conditions – These rare conditions are cystic fibrosis or celiac sprue. The child’s body could not absorb the desired amount of fluid making them dehydration unless given fluids intravenously. Isotonic dehydration – When a child has decreased urination, low blood pressure, tachycardic and cold and clammy extremities. The consciousness of a child may also be affected. Hypertonic or Hypernatraemic dehydration – The child becomes irritable and sometimes seizures are present. The sodium concentration in the body is more than 165 mmol/L making the child disoriented as well as the nervous system is now affected. 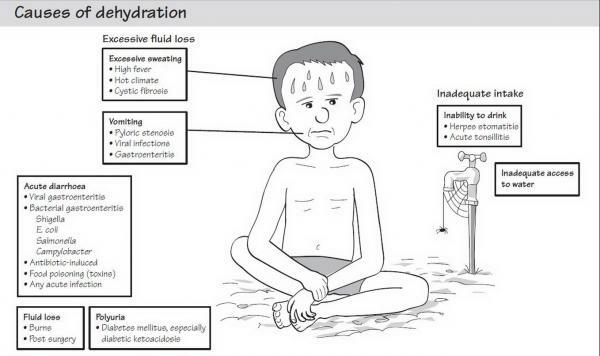 Hypotonic or Hyponatraemic Dehydration – The child has a low sodium level due to excessive urination. The excess fluid loss makes the child weak. Seizures are also noted to happen in rare cases. Consultation to a physician – A child can be brought to a doctor when he or she has a dry mouth, inability to urinate for four to six hours, sunken eyeballs, fever and being weak. Admission to a hospital – A child must be admitted when the child becomes lethargic or shows symptoms of being sleepy most of the time. An abdominal pain that cannot be cures can be another symptom. A dry mouth of the child can be another reason for bringing him to the nearest hospital.